Heels that add sparkle and shine to your wedding day look. 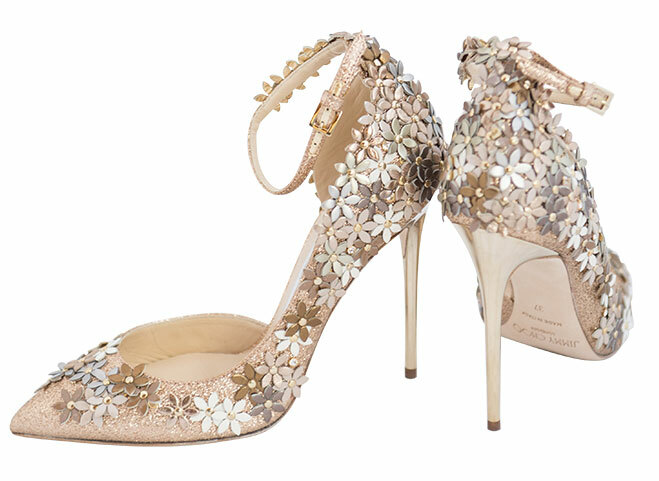 Jimmy Choo’s glittering Lorelai d’Orsay pump is a head turner. Leather petals in tones of silver and copper are hand-attached with a gold stud and finished with a sleek gold heel—perfect for a glam garden party. $1,495, multiple locations, jimmychoo.com. Art Deco–inspired brides can evoke Daisy Buchanan in dove gray Emmy London pumps with crystal and glass beading fanning the toe and heel. Gold leather straps are secured by dainty crystal buckles on each side of the ankle. $765, at emmylondon.com. 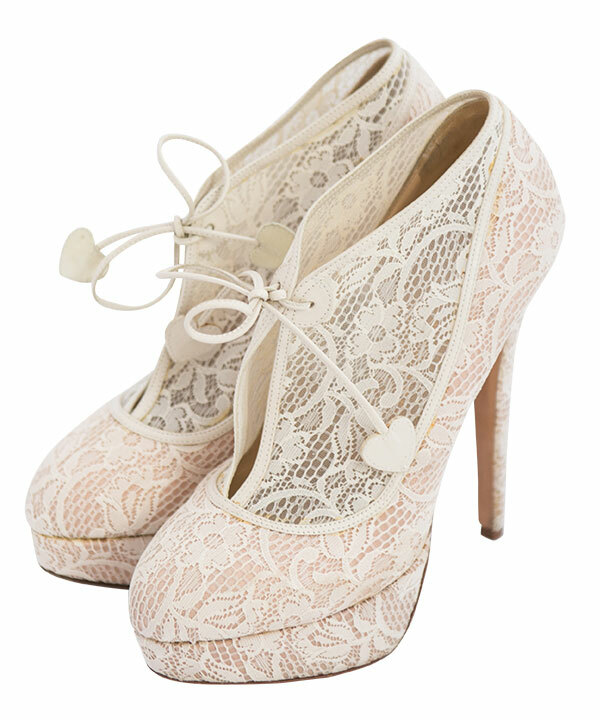 Charlotte Olympia’s blush platform Minerva bootie is achingly romantic with an ivory lace overlay, a duck-egg blue insole and white leather ties finished with a heart. And while they are bridal in essence, these boots made for walking long after your wedding day. $990, charlotteolympia.com. 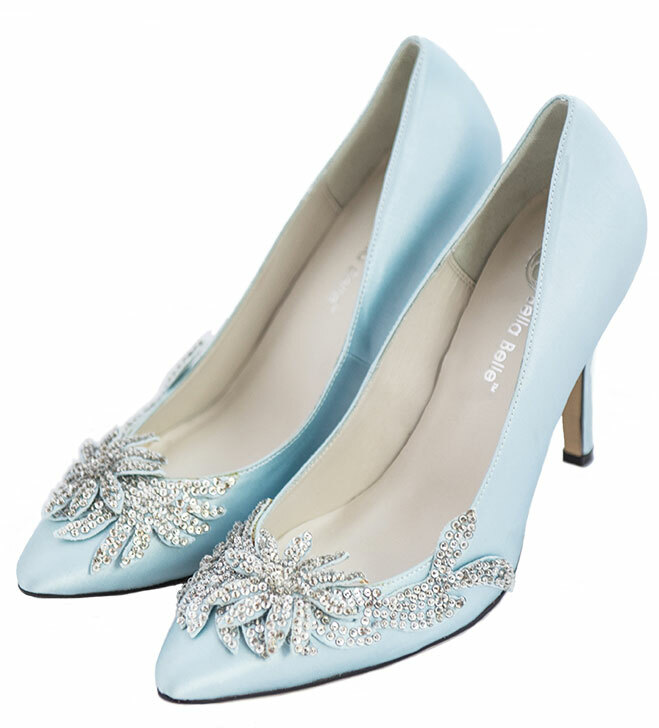 Perfect for “something blue:” Channel Cinderella in Bella Belle’s powder-blue silk satin pumps encrusted with silver glass crystal beading. Just keep ‘em close, these are too pretty to lose at midnight. $245, at bellabelleshoes.com. 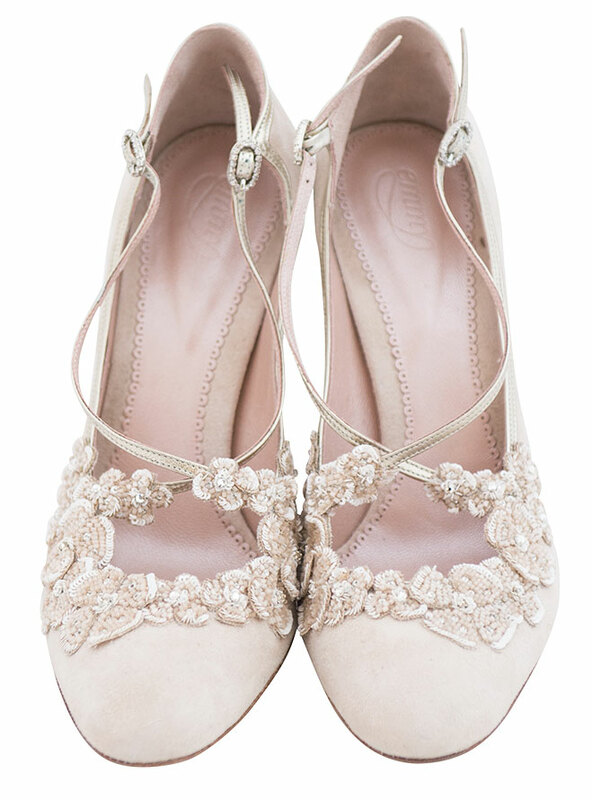 Emmy London’s British-inspired pastel pink kid suede pumps provide support with delicate gold straps, while hand-beaded ivory sequins, blush beads and Swarovski crystals rival the sparkle of a reception chandelier. $957, at emmylondon.com. All brides to-be have heard the Victorian-era rhyme reminding them to carry "something old, something new, something borrowed and something blue" on their wedding day, but shoe designer Jessica Bedard is wrapping this timeless saying all into her unique bridal shoes.